At JLD, we understand about rare and special guitars. We also know that everyone in the world can't be an expert luthier. The JLD Bridge System has been designed to be installed through the soundhole in less than a half an hour by just about anyone. There is absolutely no modification to your valuable guitar involved. 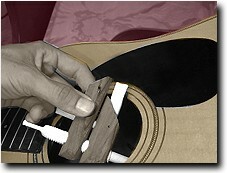 The JLD Bridge System installs quickly and easily through the soundhole. Our special bridge pins are used to mount the JLD Bridge System inside your guitar using your existing bridge pin holes. They also make string changing much easier and are available in plain brass or with abalone or mother of pearl inlay.